Tottenham Quakers have been involved for some years in projects which welcome forced migrants and asylum seekers becoming one of over 50 Quaker Meetings nationally to provide sanctuary to those who need it. Fridays from 11am onwards. 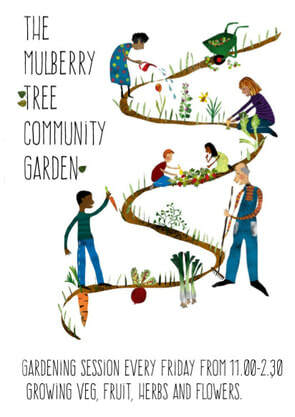 The Mulberry Tree Community Garden is a place for growing fruit, veg, herbs, flowers, skills, ideas and community. It is open for everyone and we especially welcome asylum seekers, refugees and other migrants to join in, get to know the neighbourhood and find a sense of belonging. 594 Tottenham High Road, N17 9TA.